at oven to 350 degrees. Rinse salmon and pat completely dry with paper towel. 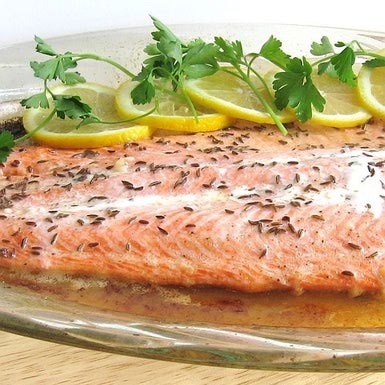 Place salmon skin side down in a shallow baking pan or ovenproof platter that has been lightly coated with cooking spray. Brush entire surface of salmon with melted butter. Season with salt and pepper, sprinkle with caraway seeds and lemon juice. Cover loosely with foil and bake about 25 minutes, basting occasionally with pan juices, if desired, until fish flakes easily when the tip of a knife is inserted (don't use a fork). Transfer to a serving platter or, if baked on an ovenproof platter, place on serving table. Spoon pan juices over salmon and garnish with lemon slices or wedges and flat-leaf parsley. May be eaten hot or cold.